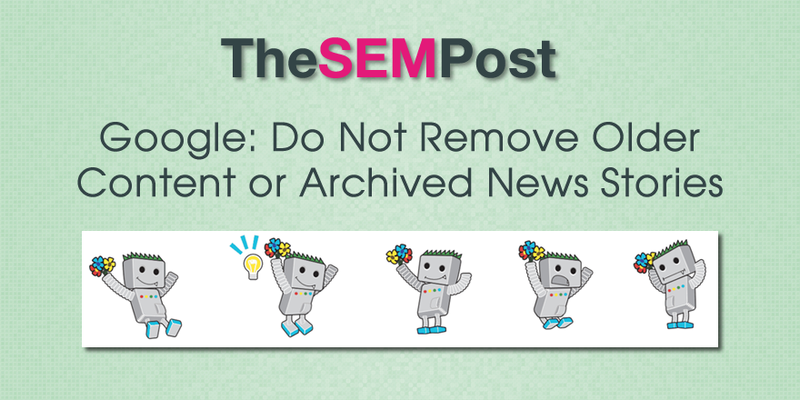 It has become a trend by SEOs to remove older content, especially older content on a news sites, where sites remove content rather than simply archiving it. Reasons why some do this varies, but the common reason is simply that it is old or dated. Gary Illyes from Google tackled the topic at State of Search in Dallas this month and he had an explicit warning – if you remove this older content, you will lose traffic. I asked Illyes whether there was any benefit to removing this archived content, especially when many of these older stories have links to them or are cited on sites like Wikipedia, and it delivers a poor user experience to serve a 404 rather than the news story. From Google’s perspective, I’m going to bluntly say that no. And you will probably even decrease your traffic because if those pages are getting traffic and you delete them, then you are not going to get the traffic anymore. Obviously, you can redirect that page somewhere, which would be more relevant in your mind, but I typically disagree with that as well, just like you for the same reasons. I like history, I like to see content that was published in 2001 for example, it’s a very hurtful example, but imagine if news sites started to delete all their content about 9/11, it would be a shame. This is true, as news sites remove those older news stories, it becomes harder for searchers to find relevant news stories related to all kind of topics, whether it was a specific event that happened, or research into a specific person. As Illyes mentioned, the removal of news stories published in the days following 9/11 – or any event – would be a huge loss. But sites can expect traffic loss and additional page views within the site that archived stories can often bring, especially those news sites that link to related stories. On the same note though, adding archived news stories can bring additional revenue, such as with New York Times archive which is now 13 million articles strong dating back to 1851. For those concerned about the content being too old or dated, often searcher explicitly search for this dated content. And as long as you can clear to your visitors the date this older or archived content was published, there is no reason to be concerned about it simply being “tool old”. Bottom line, don’t remove content for the sole reason that it is “old” as it can hurt far more than it could help. Interesting answer. is this true for every type of site? We retain archived news releases on our site back to 2014. Our corporate policy suggests archiving after 3+ years, with “off-site” retention for legal reasons after that. Should we be reposting our old media releases?